First and foremost, I must self-promote for just a moment. This Saturday night will be the 3rd installment of the new La Paz Late Night series hosted by myself (Burgers), Potamus, and Vitalic Noise. 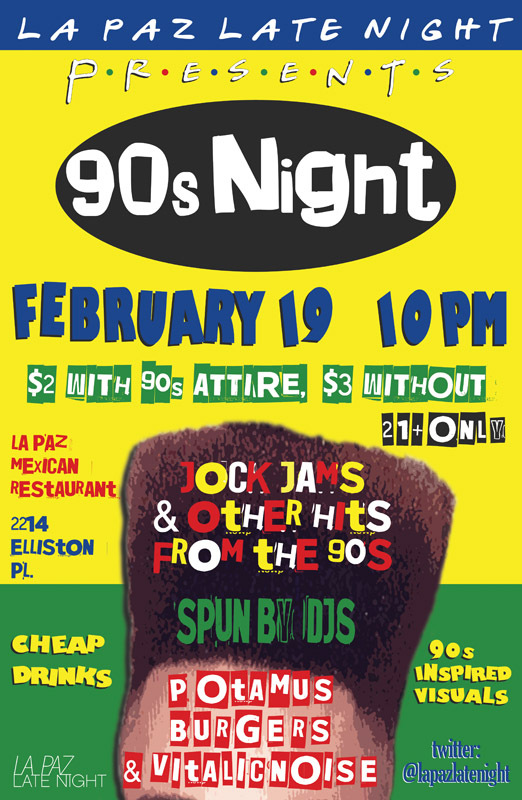 This month we’re doing a 90s theme and it’s going to be the most ridiculous night of unironic nostalgic pleasure you’ve seen in quite some time. We’ve got all the danceable jams you can imagine from the 90s, even a few “jock jams,” as well as lights and a projector that will be showing classic 90s films like Clueless and Reality Bites on the wall. We also have our usual cheap drink specials- $2 jello shots/$2.50 PBR tallboys/$4 margaritas. It’s a meager $2 to get in if you come in 90’s attire, $3 if you come in 2011 attire. DO IT. Jimmy Eat World w/ David Bazan @ the Cannery. 9pm, $25 adv./$27 DOS BUT I’M PRETTY SURE IT’S SOLD OUT. Well duh. You’re coming to La Paz Late Night. BUT, if you just can’t do unironic nostalgia thing, you could go see Cheap Time, D. Watusi, Slammers, and Fox Fun at Glen Danzig’s House. That’s only $2 and starts at 7pm.